Confesor, Cabili and Kalaw are out of the Cabinet. Their appointments would have been disapproved in the Commission on Appointments anyway, for justifiable reasons. The three are temperamentally unfit for such high positions. They are not only unprepared for such important responsibility but their prestige among the people is very low. They have done a great dishonor to our country in that they have done the most to divide us with their blind and indiscriminating prejudice against those who held any kind of position in the former regime. According to them, all those people are traitors to their country; that the only patriots are those who ran to the mountains and stayed there, those who issued emergency notes Like Confesor and Kalaw, or who did not join the government because the “buy and sell” business was more profitable. The Commission would have disapproved the appointments of the three with a full and public exposition of the reasons. Osmeña sensed trouble brewing. He immediately withdrew the appointments of Confesor anc Cabili, and appointed them to the Rehabilitation Commission in the U.S. Kalaw was made a book collector in the U.S.A. These are strictly political appointments. What can Confesor and Cabili do? Instead of helping they will prejudice the mission entrusted to the Rehabilitation Commission since that requires not only ability, but above all tact, moderation, and subtleties of diplomacy. These two men absolutely lack these qualities. As to Kalaw, isn’t it degrading that an ex-member of the Cabinet will merely be a book collector, a work that any instructor in a University can do? The worst part of it is that poor Juan de la Cruz is always the victim. The three men must be getting the salary of a Cabinet Member in addition to per diems and many other allowances of officials detailed abroad. How can we convince the people that we have the welfare of our country at heart? Such action is weakening Pres. Osmeña. It may cost him the presidency. The general remark is that he is not using his appointing power judiciously. It is also suggested that debts incurred during the Japanese occupation be revalued as of the date the debt was incurred. I think this is also a private matter which should be left to the courts. Furthermore, in almost all cases, the estimated value of the military note in the future had already been taken into consideration. I know for instance of a ₱100,000 indebtedness for which the debtor will pay only ₱5,000, but in Philippine currency at the time payment. It seems that some banks refused to admit as security all real estate acquired during the Japanese occupation. This is a wrong attitude. If the owner has a Torrens Title, that should be enough for any bank to grant credit. If the guarantee is sufficient, the bank will not lose anything having acquired interest in good faith. But again this is a matter that should be left to the courts to decide. The buyer in good faith must be protected; on the other hand, sellers in bad faith must not be allowed to take advantage. The Chamber of Commerce has asked for a definition of the policy stating that unless this is settled rehabilitation would be difficult. The Chamber is right, since the amount of real estate transactions during the Japanese occupation was enormous. Many more questions like this will arise in view of the decision of Judge Dizon that all court proceedings during the occupation are invalid. These cases should be appealed to the Supreme Court for final ruling. It is of transcendental importance. The Judge himself was aware of it as he suggested that an act of Congress validate such proceedings. A Colonel, Assistant Chief of the U.S. Military Police, came and inspected us today. He stopped in front of me and asked me two questions. “Are you comfortable here?”, he asked. I somewhat hesitated before answering, “Yes, under the circumstances.” What I really meant was that in view of the fact that we were prisoners, and because of the lack of facilities, the comfort that we have is all that could possibly be given. But we are not satisfied. Evidently, the Colonel understood me as he repeated “under the circumstances.” His next question was, “How is the food?” I answered, “It is sufficient in quantity, but it is not the kind of food we want. We prefer not to eat canned foods. What we want are fresh fish, meat and vegetables. We also would like to have rice. This is the kind of meal we eat as Filipinos.” He then turned to our Colonel Superintendent and asked him how they could be obtained. He even talked about fishing. Turning to me again, he said that rice is pretty hard to obtain; there is a scarcity of rice even in Manila and it costs very much. When he passed by Paredes and he was told that Paredes was our spokesman, he asked Paredes to see him. Jokingly he added, “not by motor car.” Paredes went to see him at 2 o’clock and returned after two hours. He immediately gathered us together to make a report. Paredes said the Colonel talked to him about giving us better food, allowing us to bring food in, allowing us to have our laundry done outside the camp, etc. The Colonel said that he came precisely to investigate our living conditions and he will see what can be done. When asked about our petition to MacArthur, he said that it passed through him and he passed it on to the General Staff. Whether it reached MacArthur or not, he did not know. Paredes then talked about our case. He explained that we had not been sentenced nor have we been informed of the charges against us. We believe that we have not done anything to deserve imprisonment. He mentioned some specific cases, like Bayan who is merely a technical man; that of Yulo, who supported two guerillas and gave information to the U.S. Army about what he saw in Manchoukuo which had been used by the U.S. Army to its advantage. Paredes asked that we be released; if that was not possible, that we be brought back to Manila and given limited freedom; and if this was still not acceptable, that our conditions here be improved. Here we are worse off than the criminals with long term sentences as they are allowed to go around the Colony, while we have to remain inside the stockade. The Colonel said that he fully sympathized with us, but it was not within his power to grant our request. But he believes something will be done soon since Congress seems to be very interested in us. He reported that one day the House was discussing the matter of the collaborationists issue and the discussion became so heated that the public was excluded and the doors closed. The Colonel said that the C.I.C. was supposed to have investigated us, and after sentencing we were turned over to the Military Police. Paredes reiterated that none of us had been duly investigated and, consequently, we could not have been sentenced. The Colonel then said that probably the reason was that we were merely under protective custody to save us from persons who might want to kill us. Paredes said that he would be willing to bet that anyone of the officer class here could travel from one end of the Philippines to the other without being molested. Paredes said that they probably are not aware that in placing us under protective custody we are really being punished. When we are left “incommunicado”, we are punished; when we are separated from the family, we are punished; and when we are made to eat food that we are not used to eating, we are punished. The Colonel said that the Military Police did not know anything about the merits of our cases; that MacArthur ordered that after action by the C.I.C, we be turned over to the Military Police; that they were given 48 hours by MacArthur within which to take us to Iwahig. This is probably the reason why we were shipped in a freighter where we were herded in a dark and hot hold like cattle. He added that the order is to hold us for the duration of the war. Discussion ensued as to when the war with Japan, this being the war referred to by the Colonel, would last. The visiting Colonel asserted that it would take about eighteen months, whereas our Colonel here in the camp insists that the war would last only three months. 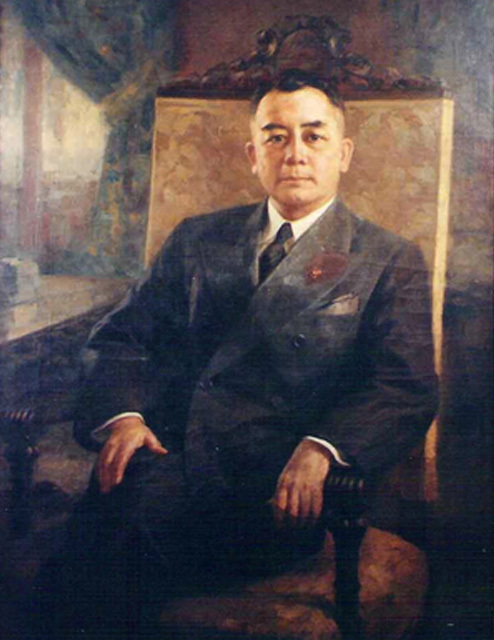 Paredes said that with the way the American Army is fighting and with the bombing of Japan by super-fortresses, the war with Japan could not possibly last much longer. Paredes and Gen. Francisco who also had a conference with the Colonel, got the impression that everything had been done in accordance with orders from Gen. MacArthur. In connection with our request for transfer to Manila, Paredes suggested that we could be confined in our respective homes, or in another place like the house or “hacienda” of Don Vicente Madrigal in Muntinglupa, or the house of Mr. Bayan in Quezon City. The Colonel took note of the suggestions of Paredes. Chief Yulo, after the report, again expressed his indignation and strongly criticized MacArthur. A few days ago, all the members of the officer class were transferred to a part of one of the buildings. We are now separated from the enlisted class by a wall made of nipa. But we are in the same compound; we are now very crowded. However, there is no doubt that things have improved. The new administration seems to do everything for us. The Superintendent is Lt. Col. Gilfilan, while the assistant is Lt. Stanley F. Hogenberg, Jr. They are both very kind and considerate and take personal interest in us. The Lieutenant saw to it that we were provided with clothes and shoes. He gave us boxing gloves and other athletic equipment, and dominoes and other paraphernalia for our amusement. He provided instructions for the illiterate prisoners in the camp. Once he asked a young boy whether he went to church. He distributed Catholic books and sacred medals. The enlisted class was required to work either in cleaning the premises or in preparing the new camp to which we will be transferred. This camp will not be finished until after three months. Sometimes men complain of the treatment accorded to them by the Captain in charge of the construction, compelling them to work even during a rain storm. Don Vicente Madrigal receives newspapers which we read. Among the news is that Confesor was bitterly attacked in the floor of the House. Representative Borja of Iloilo said that if Confesor had not left for the mountains, he would have been killed for the many abuses he had committed, especially the taking of private property. Rep Rafols also hurled charges against Confesor. Both called him names. The language used must have been terrible as they were ordered stricken off the record. Confesor should resign or ask for an investigation. He should clear himself or leave the service. If the charges are true, his usefulness to the government is over since the people will lose their respect. A government with such officials will be crippled. The other news is that there seems to be a strong movement to settle the dispute of Roxas and Osmeña for candidacy for President. It was reported that Osmeña may choose not to run if such sacrifice is necessary to effect unity. It is said that Osmeña had done it in the past and he will be willing to do it again. Roxas was expected to do the same. There was an editorial in which the withdrawal of either of them was advocated for the sake of unity. As a precedent, it cited the withdrawal of Rizal in favor of Del Pilar in Madrid; the elimination of Bonifacio and of General Luna; the conciliation of Quezon and Osmeña after the “Collectivitas-Unipersonalistas” fight and the Hare-Hawes-Cutting Bill fight. There was a suggestion for Osmeña to run for President and Roxas for Vice President. The fight seems to be inevitable, but efforts to settle matters should be continued to insure unity for the good of the country. It is reported that Senators Sa Ramain and Rama had also been detained apparently for being collaborationists, but later released for the purpose of attaining a quorum during the Senate session. I do not know what Rama did; as regards sa Ramain, he had committed acts, such as signing the Constitution, for which others have been arrested and are now suffering imprisonment. Why the discrimination? There are Senators-elect appointed during the Commonwealth Government who, under the Constitution, forfeited their right to a seat in the Senate for accepting other positions in the government. These are Domingo Imperial, who accepted the position of Justice, Court of Appeals; Roxas, who accepted the position of Colonel and afterwards became General in the Army; Sebastian, who accepted the position of Judge of the Court of First Instance; and Tirona, who accepted the position of Judge of the Court of Industrial Relations. If the four above are eliminated there can be no quorum in the present session of Congress. Already there are reports that the legality of the present Congress or the present session of Congress is being doubted. A lawyer has submitted a memorandum raising that question and Rep. Montejo of Leyte wants the question submitted for legal opinion. If the law is to be strictly adhered to, this question must be determined. Rumor circulated that the Congress has passed a resolution requesting that we be turned over to the Commonwealth Government before July 15, 1945. An employee in the office of the Colonel happened to glance at a newspaper and he transmitted the news to a colonist, one Mr. Lopez, who came running to our quarters to tell us the news. We hope this will be confirmed. It means that our friends in Manila have not forsaken us. The general belief is that Congress must have some sort of understanding with Pres. Osmeña and Gen. MacArthur, and that after we have been turned over to the Commonwealth, we will be released. Discussion arose as to why the 15th of July was mentioned. One said that the purpose is to prevent us from sitting in the Senate since Congress adjourns on or about the, 15th of July. Another said that they want us to be out before the 15th to enable us precisely to attend the session. Chief Yulo doubts whether Gen. MacArthur would do anything. Furthermore, he opines we cannot be released during the duration of the war in view of the U.S. President’s order, and if MacArthur releases us or turns us over to the Commonwealth, it will have to be declared that a mistake in considering us collaborationist had been committed. MacArthur will not reverse himself or admit he was mistaken. Paredes thinks that the C.I.C. may declare us not guilty, in which case we can be released as we will not come under the presidential order.